It’s hard for me to imagine anything more wonderful than a big, homemade weekend brunch. A few of my personal favorites (note—you’d better stop reading if you are hungry) are breakfast tacos with chorizo and avocado, homemade waffles and eggs benedict. Mimosas take brunch to the next level… party brunch. It’s probably the only time I’ll sip a sparkly alcoholic beverage alongside a coffee. It works, though. Here’s one of my favorite mimosa recipes! 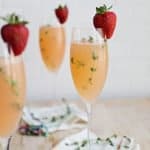 Strawberry Grapefruit Mimosa, serves one (but you’d better not waste that bottle!). In a cocktail shaker, combine grapefruit juice and five sliced strawberries. Shake, shake, shake until your juice is a dark pink color. Let the strawberries infuse in the juice for a few hours if you have time. The more it sits, the better it gets. Heh. In a champagne glass, combine the champagne and grapefruit/strawberry juice. The correct proportions are one part champagne to one part juice, but many people prefer two parts champagne to one part juice. Do what you feel, I say! It’s a mimosa. It’s going to be good no matter what. Use fresh thyme and strawberries to garnish for extra fancy vibes. Credits // Author: Elsie Larson. Photography: Sarah Rhodes. Photos edited with A Beautiful Mess actions. In a cocktail shaker, combine grapefruit juice and five sliced strawberries. Shake, shake, shake until your juice is a dark pink color. Let the strawberries infuse in the juice for a few hours if you have time. The more it sits, the better it gets. Greetings from Wine Country! A great alternative to Champagne, which can a little stuffy and expensive for brunch, is Prosecco. Prosecco has all the delicious, bubbly goodness of Champagne without the pretention. Our shop, Swanky, has a 95 pt. sparkler by L’Antica Quercia for 41% off right now that would complement strawberry and grapefruit beautifully. Check it out here: http://www.swankywineshop.com/#!todays-special/cu0c. You can also get a little more background on Prosecco, as well as Swanky Wine Shop (including our label that benefits abused dogs, Baron Cooper Wines), from here: eepurl.com/0TXE5. Have beautiful weekend, y’all! Thyme is one of my absolute favourite herbs to add to cocktails! These look amazing, have a good weekend! I want one every morning for the rest of my life! It sounds delicious! If only I wasn’t preggers! This look amazing, ladies. Hmm I must try this! We have a tradition of mimosas at any pre-noon events. This variation is sure to be a welcome change! this looks so delicious and refreshing! definitely making this someday soon. The perfect weekend cocktail, delicious! This looks so rich, you guys make everything look tasty… thats a fancy mimosa,…Happy Weekend! Oh my gosh, can I have NOW? Ladies brunch just got kicked up a notch. Forget the cocktail – what’s the scoop on the tassel napkin? I have got to try this! It sounds SO good, and so refreshing! How lovely, I can’t wait to try that! Just discovered this blog ladies! LOVE IT! Great ideas!!! I love crafts! Looks like the perfect party drink! Oh man! I want it, i want it 😀 Should plan a party for this! Where can I score my invitation to this amazing brunch of yours? 🙂 Would love to sip these mimosas while chatting about your new book! Looks amazing, definitely saved to pinterest! Thyme and strawberries, this looks gorgeous and delicious. This is right up my alley. I love grapefruit juice and champagne. Yum! That looks delish! I may try it with raspberries, where strawberry season is over here. I am already dreaming about summer days (still winter in Aus) … and this will go perfectly!! yum!!! this is so cute and looks delish! Looks delicious! A must try this weekend. Your pictures are beautiful! !